Collected from his writing from the Sydney Morning Herald, The Drum, Generation Next and his blog, the ideas that Dan Haesler presents are not necessarily new, but this misses the point. 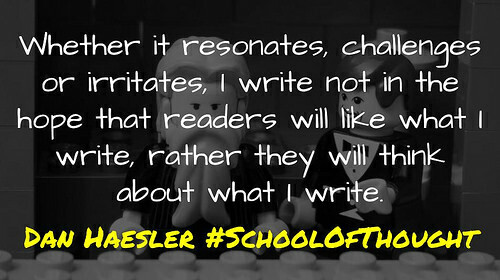 Like the work of authors, such as George Couros, danah boyd and Clive Thompson, whose ideas began life in various blog posts, #SchoolOfThought offers a different way of viewing Haesler’s work, making new connections. #SchoolOfThought touches on topics ranging from mindsets, youth suicide, educational technology, digital footprints, future employment, engagement and positive psychology. It is the perfect book for anyone trying to address the question of wellbeing in (and out of) education. The reality though is that in education all teachers are teachers of wellbeing. It is not something to be merely left to that one person in the school who carries the title. Whether it resonates, challenges or irritates, I write not in the hope that readers will like what I write, rather they will think about what I write. For in the end, you are the expert in your context. You can find out more details about where to purchase the book at danhaesler.com with all profits from the sale to support literacy programmes in remote Indigenous communities around Australia. REVIEW: #SchoolOfThought by @DanHaesler by Aaron Davis is licensed under a Creative Commons Attribution-ShareAlike 4.0 International License.